I have written before about how much I like breakfast foods, and they are usually savory, except for the occasional pancakes. I find that savory breakfasts keep me fuller longer. They’re more nourishing than fluffy pancakes or waffles. This sweet potato hash with sausage, caramelized onions, and eggs is a great way to start the day off right. Breakfast hash has quickly become a recipe that I enjoy making. It is flexible based on the ingredients that I happen to have on hand and can be made ahead of time. Taking the time in the morning to chop up and bake potatoes, not to mention caramelize onions, before I eat anything is not likely to happen. This hash, when made ahead, can easily be reheated in the oven with a few eggs cracked into the pan for a breakfast ready in 15 minutes. To make the hash ahead of time, you can use your multitasking skills. Instead of just using sautéed onions for the dish, I decided to caramelize them as a treat to my boyfriend, who lists caramelized onions as a favorite food. Since the onions take at least 30 minutes, you can brown the sausages on the stove at the same time, as well as peel and chop up the sweet potato. You then toss everything together in a large bowl before spreading it out on a baking sheet to put in the oven. 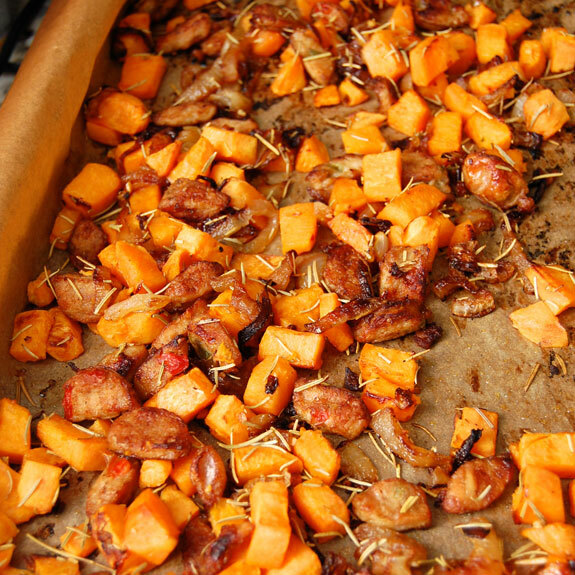 The sweet potatoes gain a nice crispiness while baking with the sausage and onions. 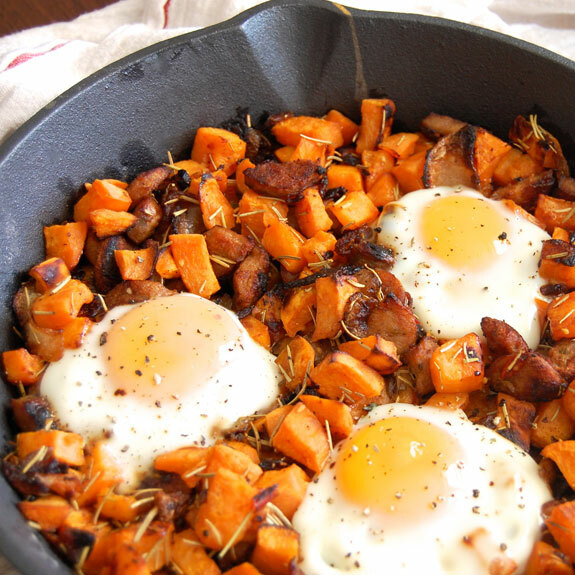 When you want to serve the sweet potato hash, simply place it in a cast iron skillet or other oven-safe pan, and make small wells to crack the desired amount of eggs into. Bake everything together for 15-20 minutes, and a savory, nourishing breakfast is ready to go. Preheat the oven to 425 degrees F. Line a baking sweet with parchment paper. Heat one tablespoon of olive oil and the ghee in a skillet over medium heat. Add the onions and sprinkle with salt. Cook on low heat for 30-40 minutes, until dark brown and caramelized. 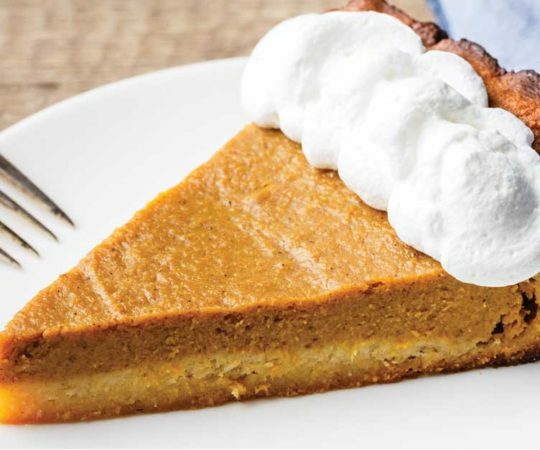 Meanwhile, peel the sweet potatoes and chop into bite-size pieces. 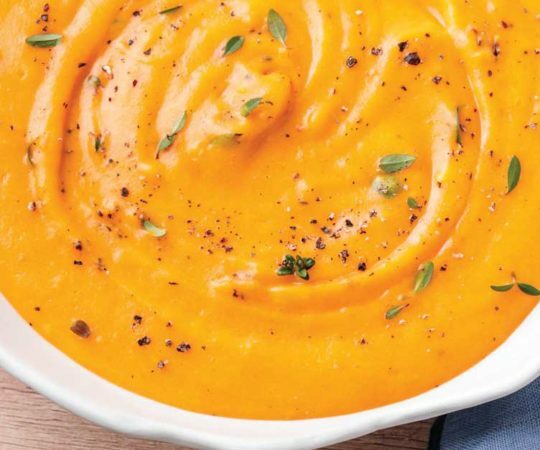 Place into a large bowl with the remaining two tablespoons of olive oil and rosemary. In a separate skillet, cook the sausages until browned. Add the cooked onions and sausages to the bowl with the sweet potatoes and toss. Season with salt and pepper. 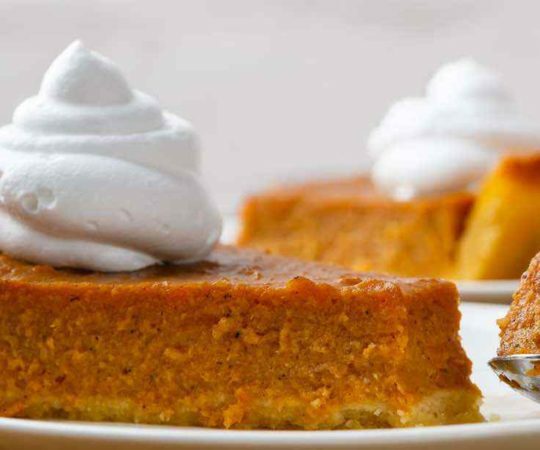 Spread out the sweet potato mixture evenly onto the prepared baking sheet. Roast for 30-35 minutes until the potatoes are soft and browned. Either refrigerate overnight at this point or proceed to the next step. 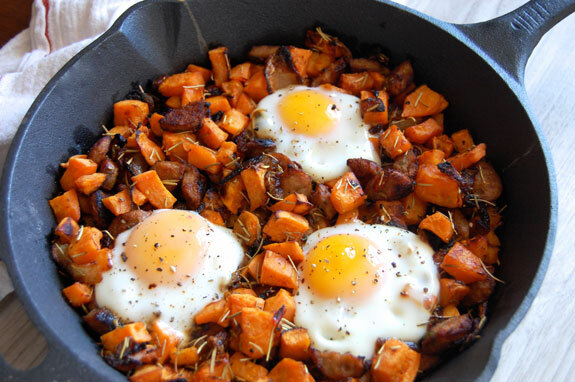 Place the sweet potato hash into a cast iron skillet and make three small wells to crack the eggs into. Crack eggs into the skillet and season lightly with salt and pepper. Bake for 15-18 minutes at 425 degrees F until the eggs are set. Might need to make a veggie version of this for dinner tonight! We love breakfast for dinner in my house 🙂 Thanks for sharing. You’re welcome Kate! Hope that it turned out – it’s easy to adapt for a vegetarian option. Go for it! Breakfast for dinner is one of my favorite things! I have made this twice now for dinner! Such an easy and inexpensive recipe to throw together and minimal ingredients required. 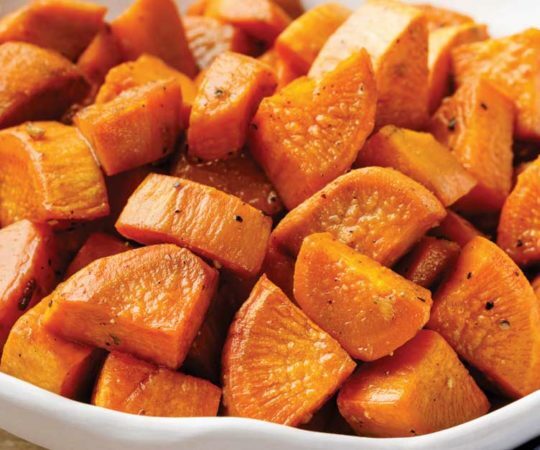 You can also easily chop up sweet potato cubes ahead of time and freeze them to use later (which can really speed up the process on a busy night!) I do not have a cast iron skillet and instead I just use a cookie sheet to roast the sweet potato mixture. I then pull the cookie sheet out, create 5 little spaces for the eggs (hubby likes extra eggs! ), crack em on the cookie sheet and bake for 10 minutes. So yummy, very filling and hits home for comfort food cravings! Great Recipe!!! Thanks for the suggestion about freezing the sweet potato cubes- brilliant idea! Efficiency in the morning is something I always want more of. I’m in Australia what is your definition of Italian sausage? We have them that they are sausage meat and spices or do your am more like a cures meat? Karen, it would be more like your sausage meat with spices. Ours are usually seen in the market as long links. I imagine any type of favorite meat would work great. My son makes this for us as a treat when he’s home from college. Uses Andouille sausage instead of Italian, and bacon, and it is Awesome! Highly recommended. This is so delicious! Made it for my 1 year old’s birthday breakfast and she gobbled it right up. Definitely suggest prepping the night before! Made this last night with the intent of just prepping and eating this morning for breakfast. 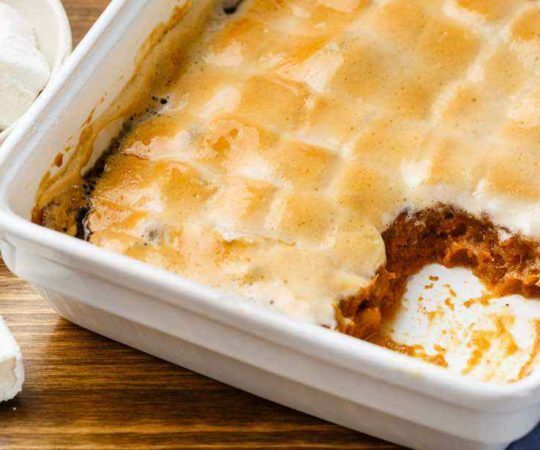 However the aroma in the kitchen was delightfully unbearable with the sweet caramelized onions and the sweet potatoes and my daughter continuously asking if it is ready, I went on to complete the dish. It was gobbled up in seconds for our dinner. Bearly had some left for my husband to try, who gave it 2 thumbs up. I had to improvise however with the recipe. I did not have sausages, so I seasoned and fried some chicken thighs in a minimal amount of coconut oil and cut those up instead. Amazing! Truly amazing!! I am making it again …right now….. LOL. I have doubled the ingredients and have bought Italian turkey sausages…I can hardly wait….nor can my daughter!! From our house to yours….THANK YOU!!!!!! Pretty delicious. My onions and sausage started to over cook on a baking sheet so I moved them into a skillet to finish in the oven with the eggs. Next time, I’ll worry less about browning the sausage and caramelizing the onions and it should be faster. Also, I used olive oil instead of ghee and dried rosemary instead of fresh. Will definitely make again! Thanks! Made this for my very first day of paleo. What a start! Not sure what makes it more, the fresh rosemary or the sausage. 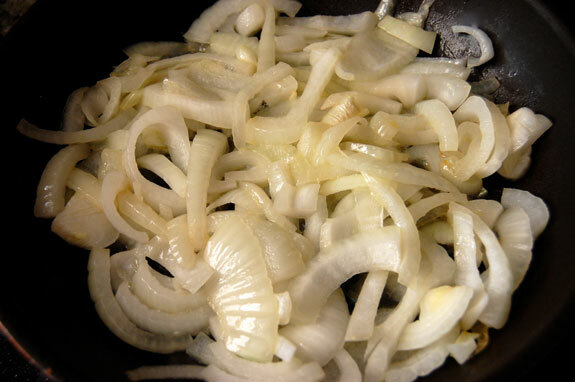 I skipped the whole first step with the onions and just cooked them with the sausage… tasted just as good. Better than any breakfast skillet I’ve ever had in a restaurant. Super delicious! I carmelized the onions, totally worth it! I also added mushrooms cause I had them on hand. The only thing I would do differently is bake the eggs with the hash less time. I like runny eggs! Thank you for the recipe! 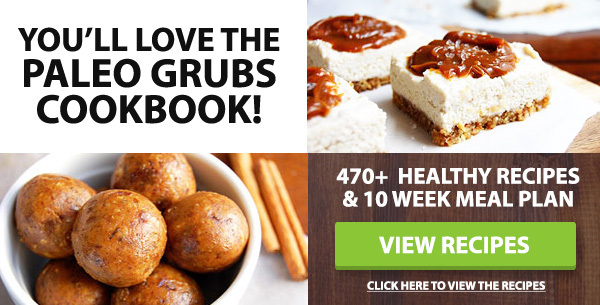 So yummy, easy, and healthy! 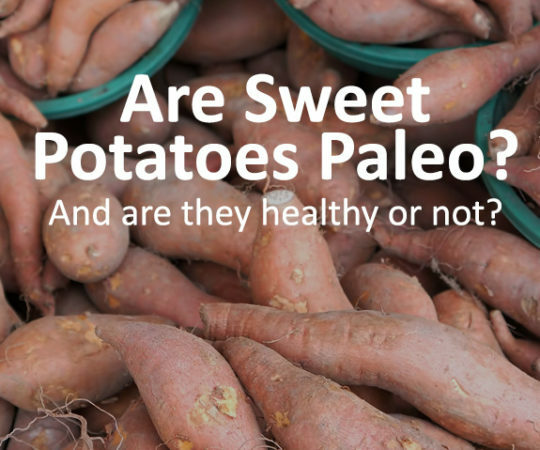 So sweet potatoes are ok for paleo diet? I’m new to paleo and i didn’t see it on the list. Awesome meal. I made it the way it’s stated and it was delicious. I can’t wait to add/sub other ingredients and mix it up – leftover diced steak/chicken, bell peppers, tomatoes, spinach, etc. Great base – thank you! Made this for one of my first paleo meals. I burnt the onions, and nearly mashed the potatoes thinking I could chop them in a food processor, and it was still great! I’m going to freeze some from the next batch, and see how it is when thawed and served with a fresh egg. Thank you for this amazing recipe. I’m making it for dinner and using turkey sausage patties in place of the italian sausage. The house smells AMAZING!!! I can’t wait to eat it. You could try par-boiling the potatoes while the onions are caramelizing then you have the option of browning the sausage for baking or just combining everything to cook in one skillet. Even if the last option is prohibited on the diet par boiling the potatoes will decrease their baking time. Also if plan to freeze potatoes or you want to speed up prep time for pasta during the week you should par boil them first as commercial food producers do. Made this tonight with vegetarian sausage…was delicious! Thanks for sharing! My husband loves this! I do too! He wants me to make it for him every day for breakfast! I am so shocked that my husband actually likes my diet food! In 3 days I have lost 4.6 pounds and haven’t cheated once! I am 186.6 and want to be 150 by January! Would never have gotten through a month of Whole30 and a following 5 months of Paleo without staples like this – it’s my go-to breakfast! I alter it a bit with olive oil, garlic and red pepper flakes instead of ghee, rosemary, and sausage. Sometimes I’ll mix it up with a hard-boiled egg or turkey bacon, but YUM! This was the starting ground for my commitment to Paleo. THANKS! New to the Paleo lifestyle, I made this recipe the night before. I can’t wait to try it for breakfast tomorrow! My only suggestion is perhaps not cook the onions and sausage together with the sweet potato and only add it when you bake it with the eggs. The sausage and onions are black! Trial and error I guess! I just made this for my lunch, I cooked the onion then removed it from the pan and cooked the sausage then added it to the sweet potato, I didn’t have an egg with it, however I do have one question you list three eggs but it makes four servings, obviously someone doesn’t get an egg-actually I guess this isn’t a question just a statement. Oh yeah I forgot to add this is delicious and I will be making it again and again. My kids like scrambled eggs instead of the whole ones. I make hash like that. Would that work with sweet potatoes? I made this recipe this morning! Wanted something differ for breakfast. It was delicious. I used leftover steak instead of sausage.